When launching your long-planned and lovingly-developed grocery NPD into supermarkets, it’s critical that it appeals to and is tried by the target consumers. Getting it into the hands, baskets and homes of the right grocery shoppers can be a daunting task, but here’s what you need to remember and how to go about it. 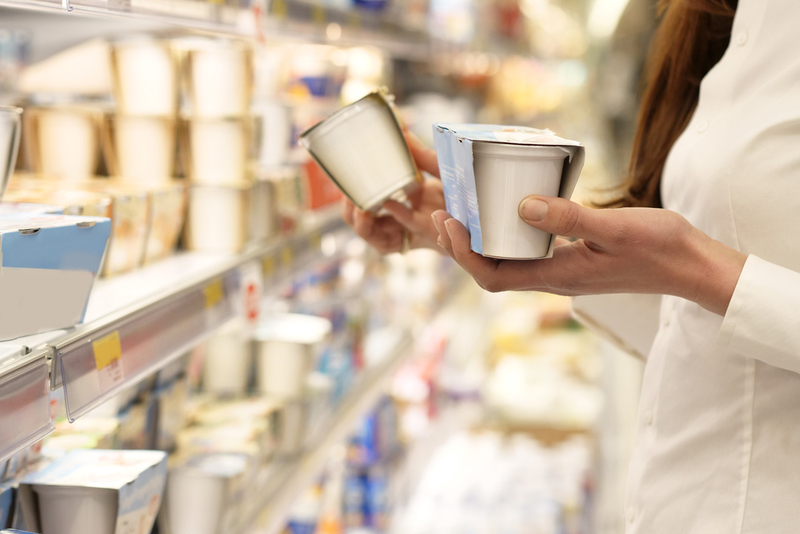 Supermarket shoppers are the key to NPD success as they are the ones who actually pick the product off the shelves and take it home, regardless of whether they, or someone else in their household is the end consumer. This is the crux of Shopper Marketing and understanding the art of getting shoppers to Pause, Pick up & Pay for your product is known as the 3 Ps of shopper marketing. In 2018 we conducted research that showed 65% of our members look at our app when they are planning their food shopping, and 35% while they shop in the supermarket*. 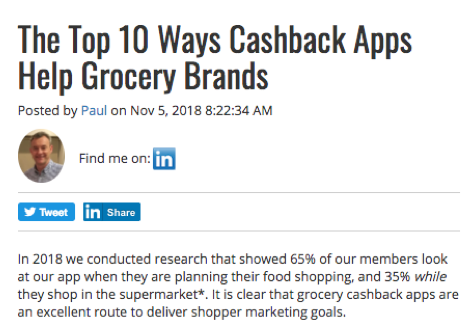 It is clear that grocery cashback apps are an excellent route to deliver shopper marketing goals. For example, we can use Geo targeting to serve brand advertising right onto consumers mobile devices at the first moment of truth, but the power of these apps goes a lot further than simply helping to raise brand awareness. CheckoutSmart, Europe’s No.1 grocery cashback app has released the UK’s Top 100 Online Grocery Brands report based on our online data. 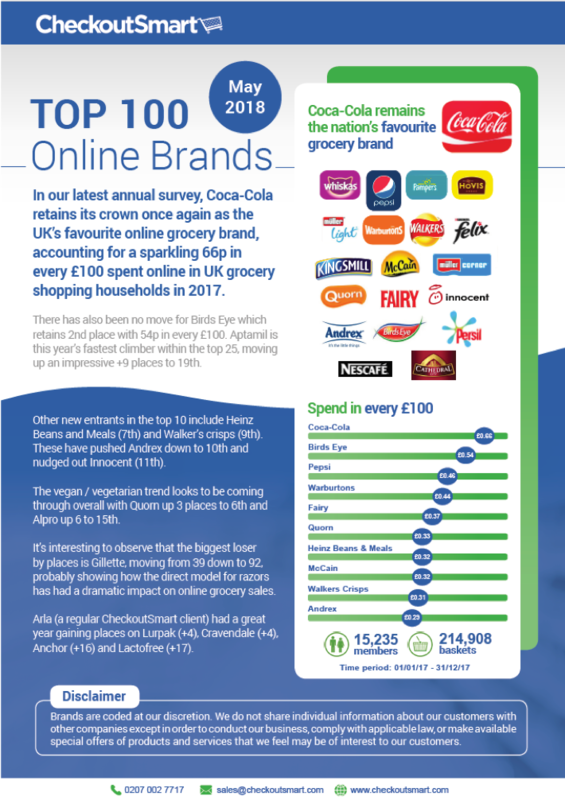 Once again, Coca-Cola was on sparkling form accounting for 66p in every £100 spent online by shoppers. This is an important club because £16.15 of every £100 spent is accounted for by the Top 100 brands. Who else was a winner? Aptamil baby milk is growing up well as the fastest climber within the top 25, moving up 9 places to 19th. The No.1 Beer brand was Stella Artois, up 14 places to 32nd closely followed by Fosters up 12 places at 38th. Their perfect accompaniment Walkers Crisps was a new entrant in the Top Ten at 9th. "On-pack" competitions with no pack changes! Registered in England and Wales, No. 8209876. © Copyright 2018, Checkout Smart Ltd.